Berlin Radio Aug 12th 1941. 6.00 p.m.
Good news from the front! : Forces from Army Group Centre and Army group South shook hands today 40 miles West of Bryansk trapping 100,000 enemy men and their equipment Elsewhere Kiev is all but taken and Vitebsk, Orsha, Smolensk and Poltava are liberated from the Bolsheviks. Our Finish allies have reached the Moscow/Murmansk rail line and our Rumanian friends are taking the city of Odessa even as we speak! The war will be over by Christmas and our boys will be re-united with their loved ones! Finland: The Fins are forced to reinforce the right flank of their drive East due to the threat from the Soviet 10th Mech and the Finish armour battalion is swapped to that side, a lone division however escapes the soviet recon patrols and moves to interdict the Moscow/ Murmask rail line. 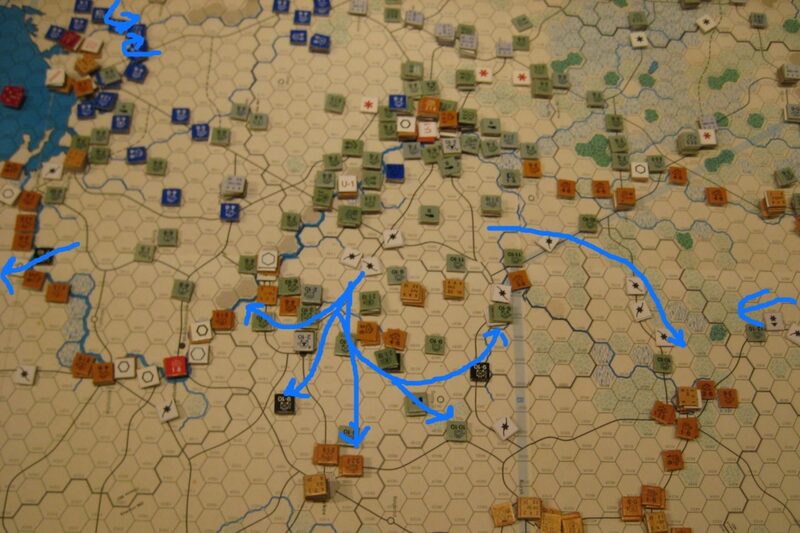 Together these moves and the more organized Soviet line precludes any attack this turn. AGN/AGC: Panzers, motorised divisions and support troops decide to take on the Soviet armoured line and eliminate a Tank/Mech stack. They exploit to encircle the left of the soviet blocking forces. The liberated 7th panzer and the forces helping it breakout join to take Smolensk and advance in the mech phase to the Rhzev region blocking the road to Bryansk. Infantry is now reaching the front in strength and take the fortified cuties of Vitebsk and Orsha (but 2 Divisions are cadred as a result). 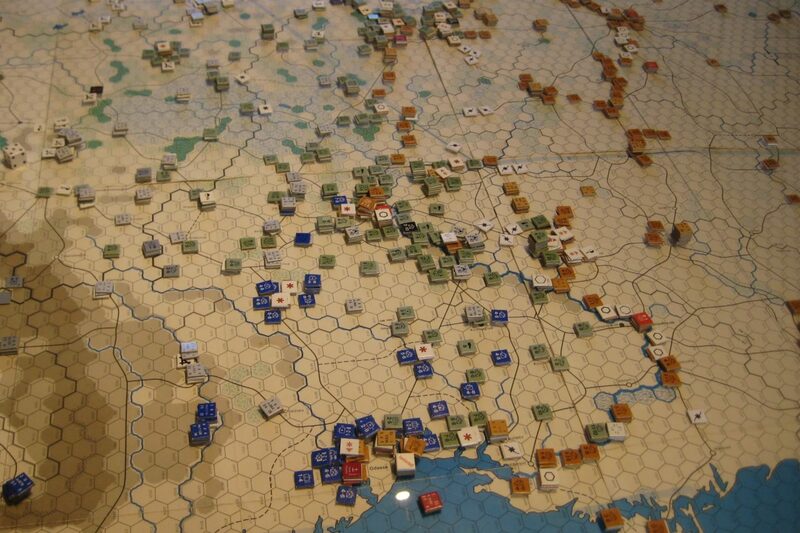 AGS The panzers encircling Kiev maintain momentum and storm the Poltava defence line in strength. 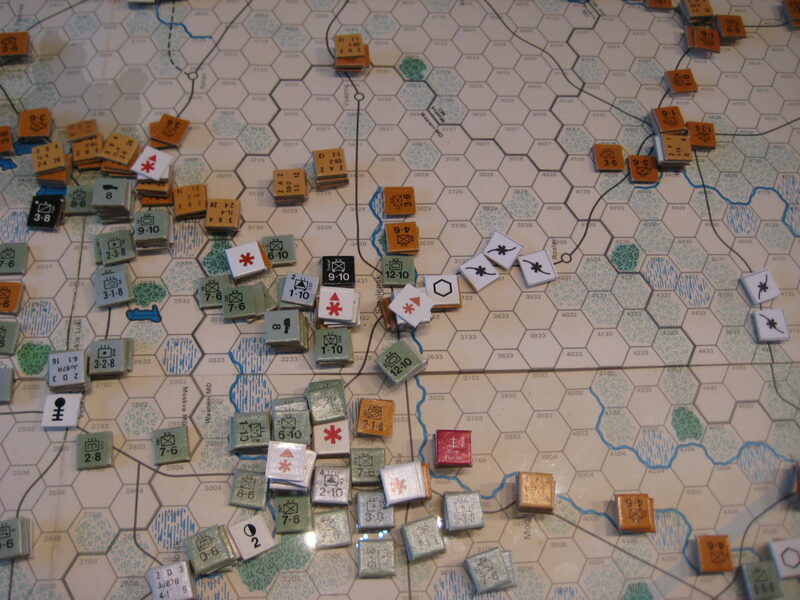 Crossing the river a 50 mile hole is blown in the soviet defence and forces pour through, A 40 point stack formed in the advance overruns Poltava!! and spreads out beyond. Exploiting Panzer and mech forces approach 30 miles of Kharkov but most swing north to enclcle the mechanised elements of the Soviet line. A much smaller force drives north from the Kiev bridgehead and occupies a position on the Gomel/Bryansk rail line. The result is that the remainder of the soviet line from Mogilev to Kiev is out of supply. 11th Army. A single Panzer has been transferred to 11th army from AGS and this supports existing Mech forces to breach the lower Dnieper and exploits to cut off the Crimea. 64 Divisions and 39 support troops are out of supply. Losses this turn; Soviet Isolated: 79, Non Isolated: 41 German 11.